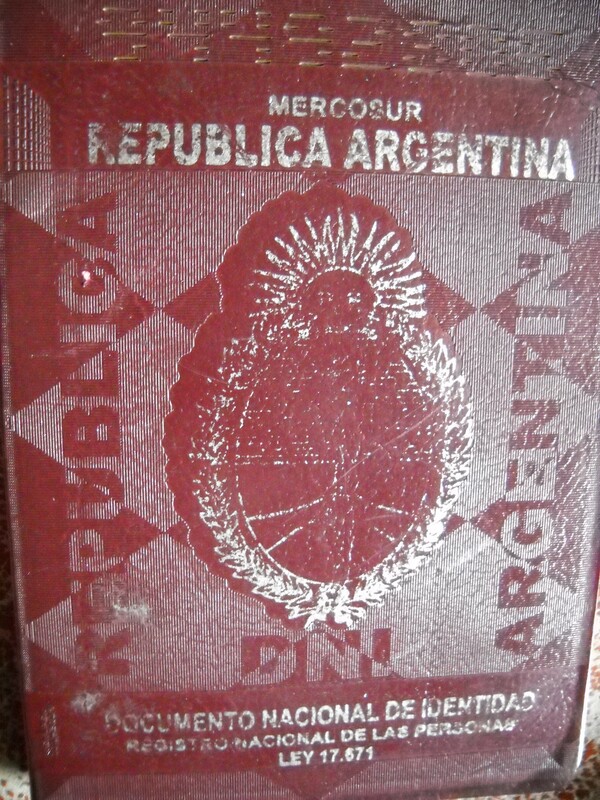 Detailed instructions for Americans (and those from any other “extra Mercosur” countries) on how to get residency in Argentina. Temporary or permanent. Go to http://www.dnrec.jus.gov.ar/ and click “ingresar”. On the next page click “02 Reserve su turno por internet”. Now fill in your basic information and select a “turno” (appointment). You’ll probably want to go to the “central” office (Tucuman 1357). Select the day, time, and then fill in you name, passport number, phone and email. Click “reservar”. Print this reservation form and bring with you to your appointment. At the bottom of the screen with your reservation that you just printed you’ll see a PDF logo. Click right above it on “Complete e imprima el siguiente formulario” where you can fill in your criminal record request form. Once you’ve finished entering your information click “enviar”. Now you can print out your “Solicitud de Certificado de antecedentes penales” PDF (criminal record certificate request) and bring that with you as well. Go to Tucuman 1357 on the day and time of your appointment with both documents in hand, your passport, a copy of your passport and cash (the cost will depend on how soon you want the certificate. 5 days costs less than $50 pesos). If you see a long line outside ask the doorman if you can go right in (tell him “tengo turno, mi documento y una copia de mi documento”). The people waiting usually don’t have an appointment. You’ll be able to print out your criminal record certificate online a couple days later. They’ll send you away with a paper with instructions and the codes you need to do this. Request your FBI records check online. Keep in mind that it can take up to 2 months to process. It costs $18 usd. To get your fingerprints taken, go to your local “comisaría” (to find the one nearest you, check online here. At reception ask them to take your fingerprints (“me podrían tomar las huellas por favor? Es para mi tramite de residencia en migraciones, tengo que pedir mis antecedentes al FBI en Estados Unidos”). To be safe, ask for “dos copias” (sometimes the FBI rejects the fingerprints you send in and asks you to start all over again). Important: make sure you explain to the officer HOW to take your fingerprints (some of your fingerprints need to be flat and others need to be rolled). The FBI website has instructions for the fingerprint card, so bring it with you and explain it to them. If you have limited Spanish bring a friend to help you. You can get a “certificado de domicilio” from your local police station. Stop by your local “comisaría” (where you had your fingerprints taken) to request one. Bring ID. They’ll fill out a request form with your information (ID number, name, address), and then within the next day or two a policeman will stop by your house to drop off the certificate. You don’t actually have to be home, someone else can accept it on your behalf as long as they give the officer the small paper you were given at the police station when you filed your request. You don’t need the certificate of domicile if you have a public service bill with your name on it (electric, water, gas), which also serves as proof of your residence. Two 4×4 color photo headshots taken from the front with the head completely uncovered, and with a white even background. Many “librerias” can do this in store. Just stop in and ask for a “foto carnet, cuatro por cuatro por favor”. As of 2013, $600 pesos for your residence, and $40 more for your DNI (documento nacional de identidad). Apostilled (this must be done in the States. Read more here). Translated to Spanish by a public translator and legalized by the “Colegio de Traductores Publicos” (This costs around $100 pesos per document and can be done at their location at Avenida Corrientes 1834, Monday-Friday 9am-6pm). Tipo de tramite: “residencia 1era vez mayor de 16 años”, and then select what area of the province you live in (ciudad autónoma), and what neighborhood. On the day and time of your appointment go to building 4 of the DNM main office (Av. Antartida Argentina 1355). Once you arrive inside tell an agent “turno extra Mercosur” (You don’t need to wait in the long line!) and they will get a number for you and send you to the “EXTRA MERCOSUR” section (sections D and K to the right). Wait for your number to be called, be friendly to the agent, and hope for the best! Once you’ve turned in your paperwork you’ll be sent to the “caja” (back left of the building) to pay, and then you can go straight back to your agent with your receipt. Then you should only have to wait another 15 minutes or so for your “residencia precaria” (they’ll call your name when it’s ready) which is a document you can use as your Argentine ID (you can even travel with it!) until your DNI arrives (2-3 months later). Unfortunately not all residency transactions go as smoothly as explained above. According to several of the Americans I interviewed for my case study of Americans living in Buenos Aires, running into hiccups along the way is common – a document that expired (they all need to be pretty up to date so keep that in mind), a DNI that never arrived, a cranky agent. If it happens to you, just remember you’re not alone, it happens to the best of us, so keep calm and carry on! This entry was posted in Expats in Buenos Aires, Immigration, Living in Buenos Aires, Visas and Residency in Argentina and tagged getting a work visa Argentina, how to get residency in Argentina, immigration Argentina by Emily Miller. Bookmark the permalink. social media profiles. Awesome publishing. Hi, great post!! The link you posted for getting documents apostilled no longer works, can you elaborate a bit on the process? Thank you so much! Hey I have got all my documents but some of them are over 3 months old now, do you know how long they are valid for in order to successfully bet the DNI?? Thanks in advance, .. great post by the way, really helped me out! Most likely the local Argentine “antecedentes penales” needs to be current (no more than 30 days old). I’m not sure if the other documentation could be older so I would suggest that you ask them: http://www.migraciones.gov.ar/accesible/indexP.php?contactenos. Good luck and feel free to ask me any other questions. Hello, my is Octavio, and I Work in a Law Firm in Córdoba , Argentina. The Firm advice foreigners on legal tópics such as inmigration, banks, etc. Hey, I just had a quick question about the Fingerprint form FD-258. Can I print this at home on a regular A4 size paper or would I have to go to the embassy to get it? (I’d have to wait two weeks for the next appointment date). Hi Robin! It’s been quite a few years so I don’t remember exact details but I believe I had it printed at a local libreria on card stock paper (cartulina). I read a few forums online and it looks like the FBI says any paper is fine, but then they tend to reject fingerprints due to low quality, which I’m guessing might be an issue with the paper. Have the form printed on card stock just in case!